Adam McLean is one of Irish road racing's brightest young talents. Adam McLean had no hesitation in committing to the McAdoo Kawasaki Racing team for a second season in 2019. The 22-year-old is a rising name in road racing and McLean made excellent progress with the Cookstown-based outfit this year, claiming his maiden international victory in the Supertwins class at the Ulster Grand Prix. Tobermore's Adam McLean won the Supertwins race at the Ulster Grand Prix this year for his first international victory. He also impressed in the opening Supersport race at Dundrod, taking second place behind Manx rider Conor Cummins for a coveted podium. The Tobermore rider, who also finished as the runner-up at the Classic TT in the Lightweight race in August, said it was always his intention to rejoin Winston McAdoo’s famous racing team next year. “That was always the plan for next year and everything went brilliant with the team this season – I really enjoyed working with them,” he told the News Letter. “Obviously we had our ups downs as a team after what happened with James [Cowton] sadly. “The bikes were fantastic and I just couldn’t fault anything in the slightest throughout the whole team. It’s nice to have continuity by working with the same team again and we’re not starting off in March with different bikes or a different team,” added McLean. 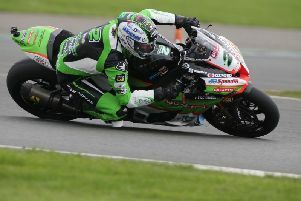 McLean hopes to pencil in some extra short circuit racing in 2019 in preparation for the North West 200, Isle of Man TT and Ulster Grand Prix, which he feels will give him a better chance of competing against his rivals from the British championship. “I’d like to do some more short circuit racing, especially on the big bike. To be running at the sharp end I think you need to be doing some short circuit rounds to become sharp,” he said. “Obviously we had a good Ulster Grand Prix, but I was racing against lads who had just come from doing BSB at Thruxton on the Sunday, whereas the last run-out we had was at a wet and miserable Armoy before that. “So it leaves you on the back foot a lot of the time and it was the same at the North West 200, because we’re arriving there from the Cookstown 100 and Tandragee, whereas the other riders are coming off the back of three BSB rounds,” McLean said. One change next year will be in the Supertwins class, when McLean revealed he will ride a 650 Kawasaki for the McAdoo team rather than Roy Hanna’s machine, on which he won at Dundrod in August. “We won’t be running with the Roy Hanna Supertwin next year," McLean said. "There are a number of reasons for that, one being that Roy has a lot of commitments and it was a bit of a struggle this year to get everything squeezed in, with building bikes and engines, so there was a lot of work involved. “Roy will still be coming along with me, almost as my crew chief if you want to call it that, and I’ll be riding the McAdoo Kawasaki Supertwin. It will be the first season in eight years that I haven’t rode a bike for Roy but he will still be very much involved with me. “For me next year, the main priority will be to improve on the big bike. I’m still learning with the 'thousand' and I didn’t do much racing on it this year, so we will try and make progress with that next year. Anyone interested in becoming involved in Adam's racing plans next year is asked to contact him via his Facebook page ‘Adam McLean Racing’ or email amr27@hotmail.co.uk.